Private rooms and/ or shared working space available. Rear Elevation with filled in porch and new stairs. Original door, sidelights, and mail slot. 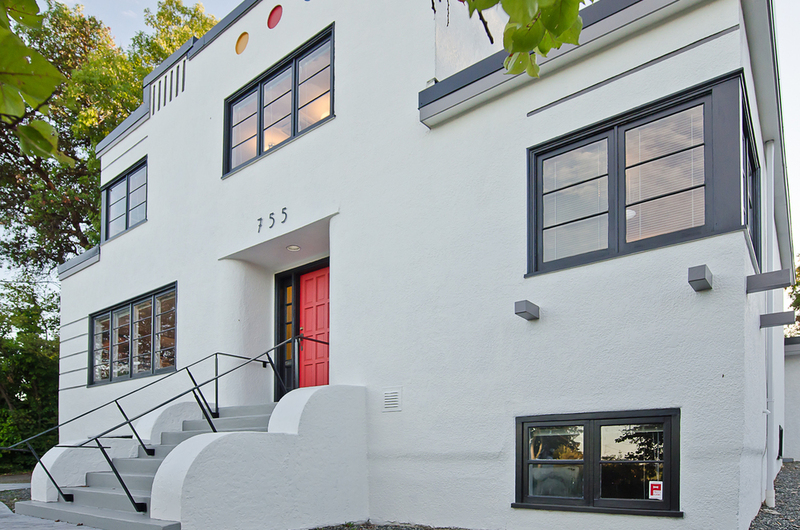 New Art Moderne house numbers and steel handrails. The three recessed circles painted primary colours from the interior colour scheme. Rear entry with recycled galvanized cable trays for stair treads. Night time shot of front entry. Two original bedrooms converted to boardroom. Features recycled maple bowling alley table top from Mayfair Lanes in Victoria. I played on this bowling alley when I was a kid! 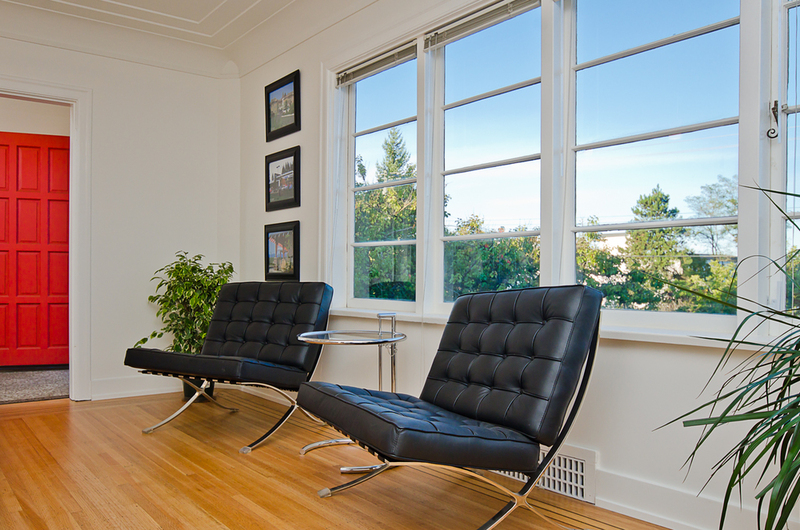 Period correct reproduction Eames EA117 chairs. Boardroom with magnetic white boards, heat pump diffuser, and adjustable halogen lighting. Upper floor corridor with exposed blue vent stack from basement washroom. Original stairs refinished and repainted in Bauhaus/ Piet Mondrian inspired paint scheme. Former bedroom closet converted to storage room with a view. Conversion of former bedroom closet for black, grey, white kitchenette, featuring Torus Mable countertops (inspired from our trip to Turkey). 'Million dollar' red walls and contemporary crystal chandelier. Took 5 hrs to hang all those crystals. Counter top with recycled fir from the basement ceilings. Toto wall hung toilet, a space saver for such a narrow washroom. Former living room converted to main reception/ common workspace, featuring period 'Barcelona' chairs, Mies van der Rohe (1929) and 'E 1027 Table', Eileen Grey (1927). 'Mexique Wall Divider', Charlotte Perriand (1953), inspired period shelving made from recycled fir fascias from Metro Toyota in Duncan. Bulkheads around the recessed shelving hide new vertical and horizontal ductwork. Teragren bamboo and coconut shell workstations with Bauhaus coloured drawing cubbies. Recycled galvanized steel cable trays used for stair treads. New solar daylight tubes as viewed from the roof. Cast iron return air grilles. U shaped bamboo/ coconut shell desk and chair (min.12 linear feet, main floor). Flexible height and configuration bamboo desk and chair (lower floor). Access to 10+ person conference room with magnetic white boards and storage room. Access to common reception area. Access to kitchenette.and lower floors. Wired and wireless internet, cable, and tel at each workstation and boardroom. Shaw High Speed 300 Internet (up to 300 mbps download/ 30 mbps upload). Heating/ air conditioning/ HRV (main and upper floors). 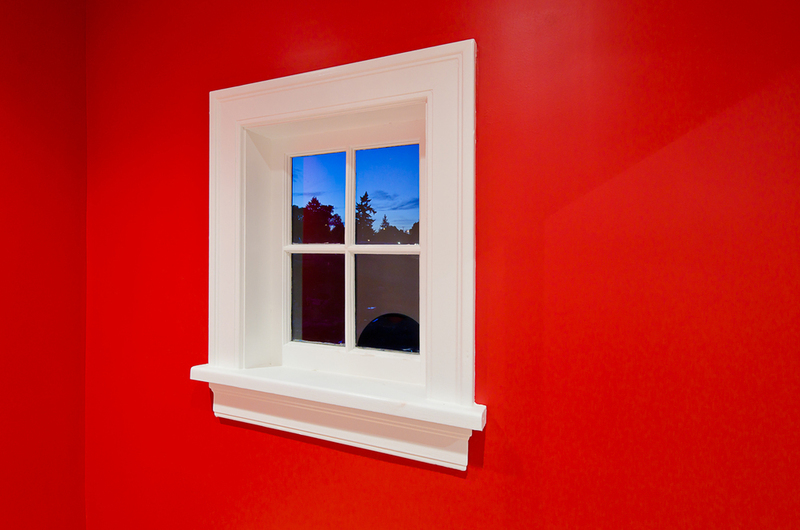 Heating/ openable windows (lower floor). On site parking front and rear. Street signage with exposure to +/-30,000 vehicles/ day. Available January 1, 2019: Shared workspace with private room and common space for 2 to 4 work stations (lower floor) $1,325/ month. Includes additional access with direct exterior door. All rents subject to GST. Along Island Highway with exposure to +/-30,000 vehicles/ day. Backs onto E & N Trailway. 325m to Harbour Front Walkway. 575m to Terminal Park Mall. 1.5Km to BC Ferries or Downtown. Productivity and separation from home environment. Ability to network, collaborate, and socialize. Shared costs with common amenities. Lower floor renovations essentially complete. Insulated sub floor with vinyl wood plank flooring. Private rooms and exterior openable windows. 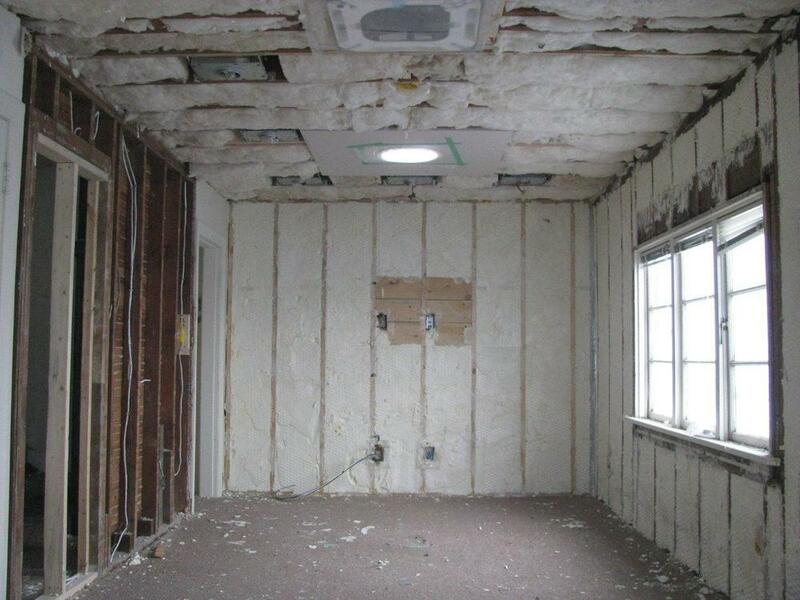 Super insulated walls and ceilings. 2nd bathroom with shower/ tub. Finishes and fixtures similar to main and upper floors.